Time to recharge your car’s air conditioning? A fully functioning car air conditioning makes our travel comfortable. However, if you have got into your car and felt warm stuffy air you could be in an uncomfortable journey. This is a very common car air conditioning problem that every car driver has to deal wit at least once during their ownership. Just like any major component, the air-conditioner will wear out eventually. When there is a drop in cooling efficiency, it’s time to have the system cleaned or recharged. 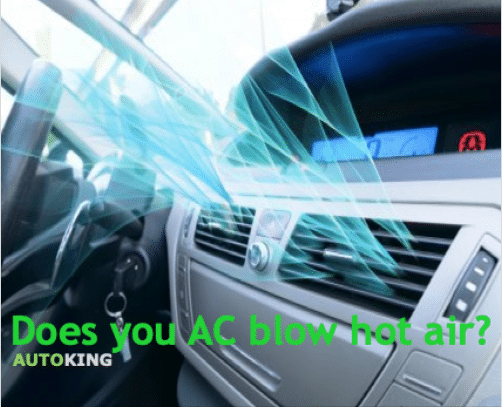 What is car air conditioning regas? Air-con re gassing is the process of removing the old refrigerant gas from your air conditioning system and replacing it with new, so your air con can run cold again. How often should you get your car Air con regassed? Most vehicle manufacturers recommend that you regas your car’s air conditioning system every 1-2 years. Regular maintenance will help you avoid potential problems in future. How long does an air con regas take? The process take about 45 minutes to an hour to completely remove the old gas and refill with fresh refrigerant. Where can I get my air con regas? At Autoking Mobile Mechanic, we offer a complete air conditioning regas service or any vehicle air conditioning needs. Trained mechanics will perform a series of checks and repair to get your air conditioner in top condition. Book Online or click CALL now for a FREE Quote! These are comprehensive vehicle identity checks which apply to all vehicles classified as repairable write-offs and are required before a repairable written-off vehicle can be re-registered. They are part of the national theft reduction initiative and are required to ensure that the identity of repaired written-off vehicles is legitimate. This is to combat the illegal use of vehicle identifiers and to stop the re-birthing of stolen vehicles. Where can I get a written-off vehicle inspection? Queensland Inspection Services do written-off vehicle inspections. They have sites in Brisbane, Bundaberg, Cairns, Gold Coast, Mackay, Rockhampton, Sunshine Coast, Toowoomba and Townsville. To get more information or make a booking, contact 1300 722 411. What is the process to get a written-off vehicle inspection? Booking times range from a few days to over a month so forward planning is always suggested. When booking an inspection, the vehicle’s details, including the vehicle identification number (VIN) make, model, colour and registration number must be provided. On the day of the appointment, the owner will need to personally present the vehicle at the inspection site. If this is not possible, the person presenting the vehicle will have to prove their identity by showing an acceptable form of identification, such as a Queensland driver licence. The representative of an organisation must show a letter of authority to conduct business on behalf of the organisation, in addition to their own personal identification. receipts for parts or repairs. Failure to provide some documentation could result in delays during the vehicle inspection. You must drop the vehicle off to the inspection site on the morning of the appointment—you are not allowed to be present during the inspection process. The inspection, on average, takes 1 day. The examiner will contact you when the vehicle is ready to be collected. If more time is required to complete the inspection, you may have to leave the vehicle at the inspection site for longer. What is the difference between a safety certificate inspection and a written-off vehicle inspection? A safety certificate inspection meets the minimum legal safety requirements to be driven on the road, as specified in the Vehicle Inspection Guidelines. The written-off vehicle inspection is a thorough and detailed analysis of the identity and history of the vehicle to ensure its identity is legitimate. The inspection includes an analysis of the vehicle’s history and repair documents. If there is any doubt or inconsistencies with the vehicle’s identity, history or documentation, the vehicles are referred to the Queensland Police Service for further inspection. The Queensland Police Service may undertake a detailed forensic inspection on the vehicle to confirm its legitimate identity. High turnover: while you don’t want to see screaming customers running in and out of the place, a revolving rotation of cars in good condition is a good sign that cars and clients are coming in, getting serviced, and going home again. Start small: having to find a trustworthy mechanic who specialises in diesel engines after your car has had a meltdown is not a position you want to be in. If you’re considering a quick health check, testing out a new service provider with a small job is an excellent way to build a relationship with a team who can be there when you need it. Let them come to you: let’s face it. Dropping your car off at a foreign location, taking public transport to work, and then coming back to discover your car is still not ready for the drive home is terrible. To ease the burden, look for an automotive team that can offer mobile services. Their team can come your preferred location, service your car onsite, and minimise your time spent on the bus. Have you been considering a tune up? Maybe you’ve been sitting in holiday traffic and are starting to notice a little shake, rattle, and roll. We’ve all been there. Our team at Auto King can offer same day services and will always provide you with a clear cost quote that will never be exceeded. Want a diesel specialist to take a look at your investment before it’s too late? Call Auto King today – we can have you back on the road in no time. Homes, cars, that blue suit you had to fork over $800 for to wear to your brother’s wedding – most of us buy investment pieces expecting them to last. We also understand that life happens. Engines fail, homes need maintenance, and that suit? Well, threads fray. We admit that we’re a little biased, but, here at Auto King we believe that a little preventive care can take your diesel engine a long way. And the first thing that can keep your car on the road and out of the service station? Knowing what causes an engine to break down in the first place. Using the wrong petrol, water contamination, and long-term idling are some of the most common factors that can impact the life of your engine. And, hey, we live on the Gold Coast. Heavy rainfall and city traffic might be unavoidable, but following even a few simple tips can have a profound impact on your car’s lifeline. Why, you ask? Like many locals will know, water contamination can, unfortunately, come from and in many forms when living on the Coast. From saltwater corrosion to heavy rainfalls (read: flooded engine) that seaside view is countered by increased condensation and rust. Breathing in the salty air might be a treat on that early morning run but too much H₂0 can ruin gaskets. Finally, for the city slickers who believe keeping their travel within the inner city limits is a good idea, the reality is that long-term idling (read: traffic) can speed up an engine’s wear and tear. Most cars take a while to heat up to a temperature that allows the system’s condensation to evaporate. This means that by never driving more than a couple kilometres, your car will rarely heat up to a point that gets rid of that salt water goodness. Furthermore, the heavy system usage required of a stop-and-go drive can result in engine leaks and lead to diluted fuel. Starting to reconsider your driving habits? Fear not – you won’t have to resort to a PT commute just yet. If you’re a proud diesel owner, and would like to uphold that title, you can book in with your local mechanic for a quick check up, or, keep an eye out for the following concerns. Already recognise a few of the warnings signs below? That’s a pretty good indicator something is amiss. Call your mechanic and stop the problem while you’re ahead. Your wallet will thank you. You’re in the car, traffic is clear, and you can see the freeway up ahead. But wait – transitioning from a cozy 70 km/h up to 100 clicks isn’t happening. You test your peddle pressure – is it beginning to feel like your car can’t pull its own weight? Having trouble going from zero to a hundred? Acceleration problems can be a sign there is trouble in paradise. The car has started – that’s a good sign. You’re out of the driveway and on the way to work but now that first red light isn’t the only reason for concern. Is your car shaking like a small terrier while waiting to Pass Go? While most idling diesels have a little rumble under the belt, being tossed around in the driver’s seat is not the feeling you’re after. Mid-road trip. You’re 100 kilometres out into country Queensland driving with nothing but clear skies and empty trails. Until, that is, you notice that clear blue sky isn’t as sunny out your rearview. Starting to see black smoke coming out from behind you? From a faulty injector to a damaged EGR valve, most mechanical meltdowns that result in smoke are not optimal fuel mileage friendly. Road trip = cut short. Looking for a quote? Click here to contact our team. Do you want to get the best life out of your car? Most drivers expect more from their engine than moving from point A to B. Unfortunately, our team at Auto King sees exhaust system wear and tear each and every day. And most often? The break down was sped up by the most common, and often preventable, roadside behaviour. If you’ve swung by our service shop, chances are you live in the Gold Coast or somewhere along the Queensland coastline. While we may enjoy the benefits of the sand and sea, the realities of coastal living can take a heavy toll on your car. Concerned you may have been hitting the roads a little too hard? Worry not – most drivers own a car with the intention of driving it (so do we). On the bright side, you can jump start protecting your car from the elements by following a few preventative measures (before the situation becomes total chaos). Want to keep your wheels spinning? Give these tips a test run. Trust us, it’s a good idea. Let’s be honest – we’re mechanics. We’re not as concerned with sticking to ‘this season’s colours’. This means that we still consider patches of ‘copper’, ‘rose gold’, or ‘bronze’ to be warning signs. Spot a spot of rust? This is a sign of corrosion. Living near the beach has its perks. So does breathing in fresh, salty air – unless you’re an exhaust system. Salt water has a knack for affecting everything from the body of a vehicle to the underside. Go for a walk around your car – maybe even take a peek underneath. See any rust starting to sneak in? Get this addressed ASAP before that spot grows into a section. While we can’t think of anyone who enjoys the stop and go of city traffic, the effects of being stuck in that morning jam will take a toll on more than just your sanity. Cars that only run for short periods of time never heat up to a temperature that allows condensation to evaporate. Though you might have believed the brief commute would be better for your favourite hatchback, lingering water can lead to rust, engine holes, and leaks. Although we praise the man who designed the intricate exhaust system, the domino effect that results from one part breaking down is a game we’d rather avoid. We know that most drivers go for the standard, unleaded option at the pump. However, we also know that fewer car owners are aware of the effects poor quality fuel can have on your system. While high traffic stations will have often have enough turnover to keep a fresh supply, low quality fuel can still be found. What are the signs you’ve topped up with something less than premium? Difficulty starting to sluggish performance are a few indicators as is backfiring. Think you filled an almost empty tank with poor petrol? Stop driving and have your tank drained. Your car’s wellbeing may rely on it. Like the human body, your car’s exhaust system is interconnected. While we believe this to be a thing of beauty, it can also mean that when one mechanism fails you could be headed for a total system meltdown. Looking to avoid total destruction? Be proactive. Start taking a walk around your car on a regular basis to look for leaks. Drive around the potholes. And, if or when you do scrape the pavement after pulling out of your driveway, check that the exhaust hanger is still intact. Is it damn near reaching the ground? Get it fixed. Sound easy? Great – we hope you start putting some of these practices, well, into practice. But if you’re like most drivers, and are more concerned with going from home to work and back again, you may have forgotten to check for rusty patches. Or, just maybe, you didn’t think to “circle around the body of your car checking for wear and tear” when you got home at 10 o’clock last night. We don’t blame you. Your next move? A: get to a mechanic for a quick check in before needing a full blown repair, or, B: keep an eye out for the following signs. See something strange? Get to your local shop – now. Poor fuel efficiency – not getting very far? Price of petrol hasn’t increased? If you’re still filling up for the same amount of money yet only getting a half-life out of your full tank – something’s wrong. And that something is that your car’s fuel efficiency – which is going down. Nobody likes to hear it, nobody wants to smell it. (Least of all you, when trapped in a traffic jam, at 5pm.) If your car is starting to smell like a summer compost pile, and you didn’t leave last week’s dinner under the seat, do we have to tell you that something is wrong? Does it take a few tries to ignite your engine? We’re not talking about your morning coffee. If you’re having trouble getting the ol’ engine going (which was, in fact, designed to catch on the very first try) you’re likely doing more damage than good. Get in, start up as best you can, and go off to the garage. Are you starting to notice some of the above signs? Preventative care can seem frivolous at the time but can also ward off major repairs down the road. And we get it – most people don’t drive their car considering the effects of salt water damage and traffic jams. Want to check in and ensure that your car and finances will keep rolling forward? Reach out to our team for a service quote that we guarantee to never exceed. Too busy to stop in? Ask about our mobile services and let our team come to you. There are different types of guarantees and warranties that may apply when you buy a vehicle in Queensland. The age and type of vehicle can determine which kinds of warranty will apply. If you are planning to buy a vehicle (new or used), you should know about the warranty that may apply. The law automatically gives you rights whenever you buy goods and services, including vehicles and trailers. These are your consumer guarantees. even if other types of warranty have run out. is not defined by when other warranties run out. will live up to any other promise that the business makes about its quality, condition, performance or characteristics. The dealer cannot refuse to honour a consumer guarantee. They can’t make you sign them away. anything that you fitted to the vehicle after the time of sale. Find out what happens if a vehicle doesn’t meet a guarantee. When you buy a new vehicle, the seller must give you a copy of the manufacturer’s warranty. Make sure you study the warranty conditions carefully. If you do not understand anything—ask the seller to explain it. If you buy a new vehicle, you should get a qualified mechanic (who does not have anything to do with the seller who sold you the vehicle) to do a full inspection before your warranty runs out. The mechanic can point out any problems while your vehicle is still under warranty—saving you money later. We call this a statutory warranty. It protects you from financial loss if your vehicle is faulty. date of manufacture is less than 10 years before the sale date. The warranty expires after 3 months or the first 5,000km. vehicles that are on the ‘written-off’ register. Dealers or auctioneers must tell you if a vehicle does not come with a statutory warranty. placing signs at the main entrance to the dealership. Your statutory warranty will cover most defects. has worn out so much that it no longer works. If your vehicle needs repairs under your statutory warranty, you must give written notice to the warrantor of the defect. tell you how to get your vehicle fixed. they will be responsible for repairing your vehicle. an authorised repairer of their choice. They will have 14 days to fix your vehicle. You get an extra day added to your statutory warranty for each day of repairs. The authorised repairer should be less than 20km from the warrantor’s place of business. They may only use a more distant repairer if you agree to it. pay delivery costs if they decide to use another repairer. You should always try to resolve any disputes with the dealer. If you are not happy with the dealer’s response, you should then make a complaint to the Office of Fair Trading. vehicles (4.5t GVM or less) will need to be inspected every 12 months and be issued with a certificate of inspection (COI). With the increase in the number of vehicles requiring an annual COI, the Department of Transport and Main Roads (TMR) has approved the outsourcing of COIs for light personalised transport vehicles to Approved Inspection Stations (AIS). Vehicle owners will have a choice of obtaining their annual COI from TMR or from an AIS approved to inspect these types of vehicles. The frequently asked questions below provide AISs with relevant information about the new light vehicle inspection type. What will the new inspection type be called? The new inspection type will be called CL (Light Vehicle COI). What vehicles can be inspected under the CL inspection type? • special purpose limousine (LSPL). transfer vehicles, and commercial minibuses. renewed. Unregistered light vehicles are able to obtain a CL COI from an AIS for new business registration purposes. ensure the vehicle is eligible to be issued with a CL COI. • be able to upload and attach the brake test result to the inspection record in ICO. Will there be a paper version of a COI for CL type vehicles? No. A CL COI for personalised transport vehicles can only be issued using ICO. Are there any additional requirements that must be checked as part of a CL inspection? ICO when conducting a CL inspection. The approved examiner will be required to attach a copy of the brake test result to the inspection record in ICO. Failure to attach the brake test result will mean the ICO certificate cannot be completed. When will the CL inspection type be available in ICO? I want to talk about the most important things for a mechanic to pay attention to the most basic stuff in a car Mobile Car Services. You could be the best mechanic on the entire planet; you can rebuild a performance motor and make a thousand horsepower; you might be an aeronautical engineer and can build an airplane engine, but there are a few simple things that if you do no matter how good you are as a mechanic, your customers will have no faith in you. The first one happens before you even arrive on sight. If you’re a mobile mechanic and you can’t turn up on time or call your customer if you’re going to be late, they instantly lose a little bit of faith in you. So it’s just say 10% faith lost right there, meaning you’re down to 90% that they believe in your skill. So when you don’t arrive early or call, you do the service and after the Mobile Car Services is done, they come out and they notice that you’ve left just a little bit of a grease handprint over the door handle, they think you’re making a mess. So they lose another 10% faith, so you’re down to 80% of the mechanic that you were previously. When they drive off and they have no idea what you’ve done to their car, it’s just that they typically think that we’re a bit magical and they’re not too sure of what happens in the Mobile Car Services. But three days later they go to use their window wipers and there’s no water fluid in it, you lose around 20%-30% of their belief in your skills as a mechanic from that one simple thing. They think “if he can’t remember to check the water fluid and fill that up, what else did he forget?” You instantly go from a competent mechanic to an average mechanic; they lose so much faith from one extremely simple thing. Now, tools and equipment. I’m not going to go into every millimetre spanner and socket set you should have because typically if you’re looking at starting your own mechanical business you should have already been in the industry for at least ten years. Between your apprenticeship and say seven years post trade to really get a strong experience you want to have that ten years and you should have 90% of the tools that you’ll require. The other stuff you want is not that expensive. I’ll list some things that you will need that you may not have for your van. Once again, one of the most important things these days is a high quality scan tool. Now, you can finance that through Repco or Bursons, so you just have a low weekly payment, you don’t go and spend $7000 straight off. Finance that once again, keep your cash in your pocket. Or someone selling one second hand is an option. You can pick one up for $3000-4000 but when it’s new you’ve got the peace of mind that it’s got a warranty. So, first thing is a scan tool and then I’ll list all the other big items below after the scan tool. Those following are also essential an air compressor with a retractable hose, a good lightweight aluminium jack (you don’t want a heavy jack if you’re getting in and out of a van all day), a good quality Snap On air rattle gun with enough torque too remove harmonic balances. The other tool you may not have that is pretty critical to a mobile mechanical business is a booster or jump pack, the highest cranking one you can get. You don’t want to be stuck on site trying to start some high compression turbo diesel motor and your jump pack doesn’t have the CCAs to crank it, so make sure you have the best one you can buy and you’ll always be using that. And then there’s just a multitude of other tools you should have over the years, which I won’t go into. I’ll put a list down the bottom there, so you can tick that off. The next thing you need to is set up your relationships with your parts suppliers. Repco, Bursons, they’re our main two. You’ll have other options. On the Gold Coast there’s Cheaper Auto Spares, Global EFI, Ashdown Ingram, but they are the main two you want to go in and set up an account with as soon as possible. You’ll also need to get a relationship with dealerships. Typically the dealerships treat independents poorly, as they see us as a threat to their own business. They have an internal culture that independents are the enemy and as such they treat us that way. They don’t treat us with respect, their parts are offensively expensive with no margin as soon as you have to go genuine; wherever possible you should be looking at using after market equivalent quality parts as opposed to the dealerships and going genuine. Now that you have your name, your van, all your equipment, your structure and your bank accounts there’s only one thing left to do. That’s to go and find some customers. Now all the stuff we’ve done so far is the easy stuff. Getting customers is the hard part, keeping them happy is even harder. Over the years there’s nothing we haven’t tried, we know exactly what does and doesn’t work. The first thing you need to do is have a website. If you don’t have a website you’re nowhere. Don’t be like all the other new business’s and just put your name up on Gumtree because all you’ll get is cheap, crappy customers that you don’t want. You need to invest money to make money. You should hopefully have a great name and a great brand and now what you want to do is have a great website that presents professionalism to anyone that finds you online. As for the marketing of your website that’s an entire book. We’ll do another blog post on that, but a professional mobile responsive website is an absolute MUST. There a plenty of providers that can assist you with setting up a responsive website with appropriate structure for search engines and all will charge various fees based on how large they are. Look at your competitors sites and contact the agency that built them, They will typically have their brand at the bottom of the page. The next thing you need to do is networking. The best referral you can have is a word-of-mouth referral so that’s all good. You’ve asked your friends and family, now what? There’s networking groups. Go and join networking groups: BNI, Chamber of Commerce, any group meeting that you can go to with other business owners. Everyone at a group meeting will have got there in a vehicle. That instantly means they’re a possbile customer of yours. Finding a customer that owns a car is one of the easiest things on the planet. You just have to let them know that you’re a professional, can save them money and will do a better job than what the dealership will do on their own car. So Google’s number one, networking number two and there’s countless other channels and marketing that you can do but they are the first two most important, they are where 80%+ of your customers will come from. Once you get your website up and running and we will talk more about Google I’ll put a link down here for the AdWords and how it works. Click on that. But after your website your biggest source of customers will be referrals, so you have to have a strong call to action/offer for people that you’ve serviced to tell their friends about. So, a good voucher, or a call to action that we’ll talk about in another post. You also want to have Facebook. It’s nowhere near as effective as Google. People go on Facebook to be entertained, not to purchase, but it’s good for branding. People go on there to ask their friends, so if you have a good, branded Facebook page that ties in with your website when people ask about a mechanic or if you’re active you can go on there and answer questions. Another good online source is forums. Go and answer questions for people. The more you give people, the more you get back. The more content you offer, it will come back to you, so try to help as many people without asking for anything in return and that’ll be the quickest way you can get customers. Now the next thing you need after you’ve got customers calling you and you’re doing work is a way to manage it. How are you going to manage your business? We have an extremely simply system which works to the stage where we do over three thousand customers now. If you’re just going to be a man on your own and you’re going to do twenty five customers a week you know that our system that does six hundred a week will be more than fine for you. We use Google Premier account recently renamed “G Suite”. So it’s just a premium account to your Gmail account. So you have your emails come in, you use the calendar and it sends to your iPhone all the details. You can put all your bookings in there, you can create pop up reminders and it syncs with your maps so that when a job comes up you just click on your maps and it takes you straight there. You ideally don’t want to be taking your own bookings. It’s madness when you’re a mechanic, you’re going to be charging say $110 an hour, every minute you’re on the phone is essentially a $1.50 that you’re losing. If you’re not charging that hour out on a customer’s car you’re losing a $1.5 every minute. You want to outsource the bookings on your work to someone on $20-25 an hour. They can spend five minutes on a call and it equates to the same amount of money as if you spend one. You want to outsource that to your wife or a professional company TRAINED in your industry, you don’t want to do that yourself. As soon as possible you want to be doing nothing but being on the tools and billing out those $110 hours. One of the other things you’ll need is service software for quoting jobs, you should know a lot from how long stuff takes on average but you also want to be able to reference and know straight away how long something’s going to take, so you want a good software program. We’ve put a link to the system that we use below and we found very proficient in helping us with our close to three thousand customers a month. And that’s it essentially it. We’re always happy to help if you have any questions about setting up your own mobile mechanic business. There is an abundance of work out there. We don’t feel threatened by anyone else and are always happy to help and we’d love to have a good person on the team with us. If you want your own business and you want help getting up and running and as part of a team with over 250 years of combined experience that assists 3000 customers a month backing you just drop us a line below and we’ll be more than happy to organise a time to have a chat. First you need to work out what the endgame is. What do you want to be? If you just want to have a better lifestyle, a higher income and no boss then you may just want to be one man by yourself. Someone that never has any staff, except maybe someone that helps you with your bookings so that you can charge out your labour rate and don’t have get bogged down taking phone calls and the admin stuff. (Note: It is imperative that whoever is taking your calls is highly trained in both customer service and most importantly SALES!!! I have lost count of the number of competitors that i have called to offer work to when we are booked out that can’t even answer the phone professionally or show any hint of a sales path for inquiry). If you cannot convert inquiry to a booking you will be doomed form the start! On the other hand you might want to start a brand and have the goal of being the next national automotive company with the likes of Ultra Tune or Midas in ten to fifteen years. So, that’s the first thing to work out. What do you want to be? It also wants to be something that will stand out in search engines like google, something people will remember when they go back in. If you do register Sydney Mobile Mechanics there’s going to be a heap of people bidding on that search temr and potential customers will be confused about which one you are. If your name is something like “Autoxax Onsite Servicing” you’ve got more chance of them remembering your name. You don’t need to spend thousands with an intellectual property lawyer, this is all stuff you can do yourself and I wish someone had told me years ago. We spent thousands and thousands on intellectual property lawyers and all they do is go and do this stuff that you can do yourself. If your name isn’t trademarked and registered you can register it yourself for $200. A trademark solicitor will charge you thousands. Do not use a trademark solicitor if you don’t have to and it’s extremely important to trademark your name. Our first business, which was called Just Car Loans was Issued a “cease and desist” letter by Just Car Insurance though if we’d got our trademark in that would not have happened. As we were only a little guy we thought it was easier to cease trading and change the name. We changed to Car Loan King where Auto King was born from. Next, you need to pick a structure, which brings us back to the very first thing I said. Are you going to be a sole trader? Are you going to take over Australia and be the next big thing? (So do you need to be a company?) Do you have a partner? Are you going into it with a mate with two of you running round in vans? Or is one going to be in a workshop, one in a van? Are you going into it with your wife, a spouse? These are all questions you have to ask. If you don’t know what structure you will need get an accountant to give you advice. We’ve got a link down the bottom. There a very good accountant. You can call them and have an initial talk as to what your plans are and what they think is the best structure for you. Now depending on where you operate and what you plan on doing you’re going to need licensing. Make sure you apply for the relevant licence and you comply with all government legislation. This is extremely important. If you don’t comply they’ll shut you down and there’s nothing like spending thousands of dollars getting up and running and being excited about your new business just starting to get customers and then having a government department tap you on the shoulder and say you haven’t done something correctly. So make sure you check that. Once again, if you don’t know what you need to do, seek professional advice. Now that you’ve got your business name, your structure and all the legislative side of things sorted out the next thing you need to look at is making sure you’re insured. You don’t want to go and work on someone’s car and then find yourself liable in the event of an accident; so you need to get appropriate insurance. That’s also for all your own equipment. You want all the equipment in your van insured, as well as the vehicle, and then your public liability and then professional indemnity. Once again, insurance is a very specialised thing so I’ve put a link below you can click on to talk to a professional and they’ll be able to give you advice on the appropriate policies that you will require when conducting a business. Following our post about why you can’t trust a safety certificate as a reason that a car is a good purchase, now we thought we’d talk about what we do in a Mobile Pre Purchase Inspection Service. What’s included, what’s not included and how it works. So typically a customer will call up and let us know there’s a car they are interested in purchasing either through a private sale or in a car yard. We will get all their details down and then we’ll get down the vendor’s details and then we will give the vendor a call and confirm a time on the buyer’s behalf that works for both the vendor and our inspector that serviced the area. We will go out and perform the inspection on site, generate the report and then send the report via e-mail and we’ll also give a phone call and discuss the report with the customer. What’s in the report you ask? Well the report will state the name, model, the VIN, the registration, the current odometer reading, the engine number, the purpose of the inspection and then that will be the first page. The first thing we start the inspection with is the interior. We check the seats are all secure, there’s no tears, the seat belts are operative they retract, they work, they will check the trim, they will check that the radio is operative, the rear window, the washers and wiper fluid fires and functions as they are supposed to, the horn, the doors, the locks, the hinges, all the windows are operational, warning lights on the dash, the gauges are all operative, then they will report if all those items are working. The next section of the report is the exterior so we will go around looking for any evidence of rust or body repairs, we look at the glass and make sure there are no stone chips and report that, is the sun roof aerial, is it working, under the frame, across the fenders, all the underbody parts, is there any damage, is there any evidence of any impact damage, the front suspension, the rear suspension, the steering components, no evidence of exhaust leaks, the differential is not leaking, theres no play in the drive shaft. The next section of the inspection report is the engine bay. We look for any evidence of noise indicating that the engine is tired, or that there is any indication of valves or lifters, the timing belt we check the fluid levels, We check for fluid leaks, We check the engine mounts, We check all the hoses, the pipes, the water pump, the fan, We check the ignition system, the fuel system, the battery, the radiator, all the drive belts and the pulleys, the break booster, the master cylinder and the ABS. The fourth section of our report is the tyre, and brakes. We go and inspect all the tires, see if theres any indication of them needing replacement, where they are at in their life cycle, the wheels, is there any damage, have they been ran into the gutter, are they buckled, spare rim, brake hose, calipers, the brake pads, the discs, the brake linings, the wheel cylinders, the brakes and the drums, park brake, the wheel bearings. On the fifth section what we do is a road test. We try to get the vehicle on 80K’s, this isn’t always possible. On the road test we try to get up to 100K’s but more often than not we’re not able to do these if it’s in a residential area we can only typically get it up to about 60K’s. But sometimes you need to get it above 100 to see if any evidence of a wheel alignment or balance. We also check out the ease of starting, if it idles, if theres any rough idling, evidence of engine noise, engine performance when it’s under load, is it missing, is it smooth, exhaust smoke and emissions, seeing if there’s more smoke coming out the back of the car than there should be, is there any reason for a concern, is the gearbox automatic or manual, is it shifting all gears as it should be, is it crunching, is it making any noise, is it sticking, the differentials, the whining, are they operating as it is supposed to, the steering and the suspension, that theres no noise coming from the suspension, when you go over things it’s not clunking, the brakes operation, the brakes are not spongey, they do have feeling and feed back and they are gripping as they should, the speedometer is reflecting a true speed. Where possible we try to put it in 4 wheel drive, however if it’s in an urban environment once again it’s hard to test that. It really is something that needs to be tested, if its an imperative part, it needs to be taken and tested. We advise to meet the vendor at suitable location to put the 4wd through its paces. That’s what’s included in the Mobile Pre Purchase Inspection. You then get a copy of the report with the inspectors details, so if you want to discuss the report with him or ask him any specifics, his details are on the report and you can give him a call and discuss anything. What is not included in the report. The report is a visual, non-invasive report. What does this mean? It means that we don’t remove any part of the car for our inspection. We can’t remove anything from the vendors vehicle and then put it back on. So it’s a visual, non-invasive inspection. There is no warrantee with the inspection. We can’t offer a warrantee. A lot of people ask if we offer a warrantee, there is not a business in the automotive industry that will offer a warrantee on a pre-purchase inspection. One thing I forgot to mention is that we take photos of the vehicle and all the items that we have listed as needing attention that we can take a photo of and represent. So if it’s an impact damage we’ll take a photo of it, if theres any wheel damage we’ll take a photo of it and that will be on the report. Typically we find that you can get at least four times the cost on average of the report off the price of the car after you know the repair items that need to be done and most importantly it gives you peace of mind prior to purchasing.